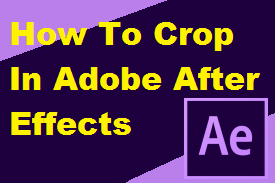 Learn how to crop the video in After Effects 2018. In this video demo, we will show you how to crop in After Effects 2018. 1) In order to crop in After Effects 2018, you need to create a new composition. 2) Then click on the “Region of Interest” tool icon. 3) Select the area of the video you want to crop. 5) Finally, click on “Play” to preview your result.